Margaret Lee - Lee Family Lineage - The Village of the Water of Leith now known as the Dean Village. Margaret Lee - My Dad Davie Lee aged between 8 and 10 year's old attending the Dean School. Margaret Lee - Walking down Dean Path past the Lampost you would come to our Stair first. Margaret Lee - Photograph taken at Strathmigo, Fife. I have no idea who the other person is. Margaret Lee - My Mum's photograph taken before she was married. Margaret Lee - My Mum and Dad's Wedding Day Photograph. 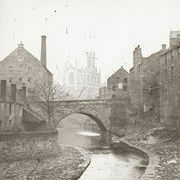 Margaret Lee - The photograph is taken in the Dean Village. Margaret Lee - Photo taken across the Wooden Bridge with Hawthorn in the background. Margaret Lee - My two older Brother's. Margaret Lee - Inverleith Pond on a Sunday afternoon. Margaret Lee - Playing in the Water of Leith. Margaret Lee - Playing in the High Green (South of the Wooden Bridge) . Margaret Lee - Member's of my Family that lived in Dean Path. Margaret Lee - Starting Dean Primary School aged 5. Margaret Lee - The Dean Parish Church played an integral part of family live in the Dean Village. Margaret Lee - Mrs Burn's Shop Dean Path. Margaret Lee - Dean Path - Christine Robertson's original Newsagent's / Sweet Shop centre. Margaret Lee - Playing Peevers, other Street Games, Hallowen and Bonfire Night. Margaret Lee - Skipping Ropes and Street and Party Games. Margaret Lee - Dean Parish Church Women's Guild Bus Drives. Margaret Lee - Family Wedding Reception at Westfield Halls Edinburgh. Margaret Lee - Left to Right, Lorna Robertson (3 Dean Path Building's) and Myself. Margaret Lee - Demolished Houses and Newsagent/Sweet Shop on Dean Path. Margaret Lee - Granny Lee (Elizabeth) lived at No 42 Well Court.